Is there a better alternative to QuickMail Client? Is QuickMail Client really the best app in Email category? Will QuickMail Client work good on macOS 10.13.4? 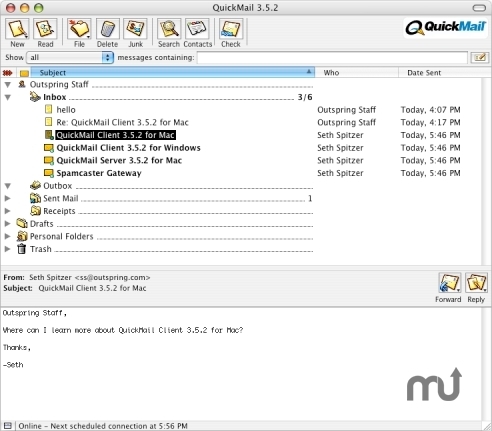 QuickMail is a reliable, affordable, easy-to-use, POP3 e-mail client for Mac OS X and Mac OS 9. QuickMail is perfect for home, office or school; anywhere you need a powerful e-mail client to communicate. Plus, you'll have all of your e-mail available whether booting into Mac OS X or Mac OS 9. If you are looking for an e-mail client that's easy to set up, has an intuitive interface and plenty of powerful features -- look no more. Fixed the bug where reported junk messages would reappear in the Sent folder when you rebuilt the folder index. Mac OS 9.1 or later, CarbonLib. Fixed the bug where certain messages can "clog" the networker, stopping the downloading of messages. Fixed the bug where the networker can crash with large text/html parts. Fixed the bug where if AUTH CRAM-MD5 fails, and the SMTP server supports AUTH LOGIN we'll use AUTH LOGIN. Improved handling of bad Content-Type and Content-Disposition headers.